Students unpacked their backpacks, listened to morning announcements, and then headed down to the gym or cafeteria with blankets and books tucked under their arms for Books, Breakfast, and Blankets. Students spread their blankets around the floor and settled in to read and snack. 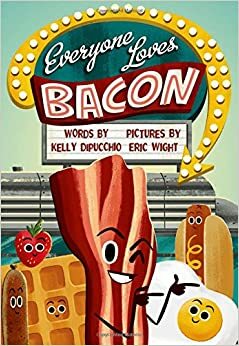 In the gym, I read Everyone Loves Bacon by Kelly DiPucchio to first and second graders before they began independently reading their own self-chosen texts. This humorous picture book was a big hit. This event was planned as a series of reading celebrations that are intended to build students' enjoyment of reading. A committee has been meeting since the beginning of the school year to discuss ideas to get students reading more. We want our students not only to read more, but to read because they are intrinsically motivated rather than because they will get a prize for reading a certain number of minutes. Previous to this event, we had a bookmark contest in which students were invited to design a bookmark and one winner from each grade level was selected. Each winning design was printed as an actual bookmark. Each grade level winner passed out the bookmark he/she designed to the students at that grade level during Books, Breakfast, and Blankets. The students who won the contest were pleased and proud that their design was made into a bookmark and they got to pass it out to their peers. Books, Breakfast, and Blankets was a fun event. Not only did students relax and read during this whole-school reading break, but teachers did as well. When I asked students about their thoughts they remarked that they appreciated the time to just read and to read what they chose. The bookmarks students designed were adorable and creative. The second grade bookmark had the slogan, "Reading is a superpower" written at the top. This week, I celebrate students who are learning to use and appreciate their reading superpower and teachers who are helping to instill students' love of reading. Reading is a superpower! I love this idea of Books, Blankets and Breakfast. Having the community of a school dive into books communicates so much. Hurrah for you and your school. How often does this event take place? 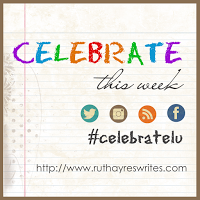 This is the first time we've ever done it, but we are planning to incorporate reading celebrations such as this one on a monthly basis. Next month, we are thinking of a school-wide reading camp-out. Students bring flashlights, sleeping bags, and books. It's so great to do some special things, and that morning read sounds nice, Lisa. I'm glad it went well! Our local wonderful Indie has a bookmark contest, and the winners are used at the store for the following year. It is an honor to win, just like your students felt. What a fun event! We've consciously tried to rework our summer reading programs because kids (and sadly their parents) were getting fixated on numbers and stamps, rather than on the simple joy of reading (we had stories of parents standing over their children with stopwatches timing their reading...) - reading can and should be a joy, all life long! What a fun activity, and what a great book to share during this breakfast reading time! (I'll have to check it out, being a bacon fan myself!) I applaud you and your fellow teachers for being creative in helping your students love reading for the sake of reading! Lisa, I always love reading celebrations for children in which they get to extend their love of reading. Thanks for sharing your joyful event. Happy New Year.